The buildings that are now the focus of the Portus Project were once extremely large and highly complex. The Palazzo Imperiale itself, for example, covered three hectares and evidence of the three stories of the building can still today be seen in the surviving standing remains. Before any geophysical survey or excavation could be undertaken at Portus, it was necessary to produce a detailed topographical study of all five buildings. 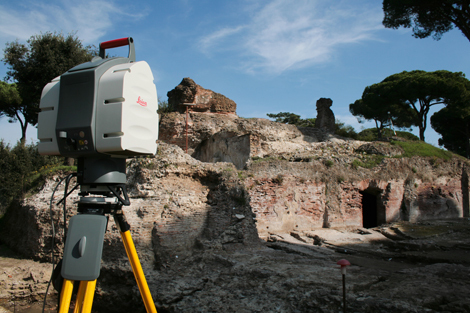 Several methods have been used for recording the shape and surfaces of buildings, including conventional archaeological surveying using the Total Station, as well as laser scanning and digital photogrammetry. The former generates line plans and elevations, and the latter creates vast clouds of points and complex surfaces. While surveying is predominantly a means to record spatial relationships, it is also a vital part of collaborative research on site. 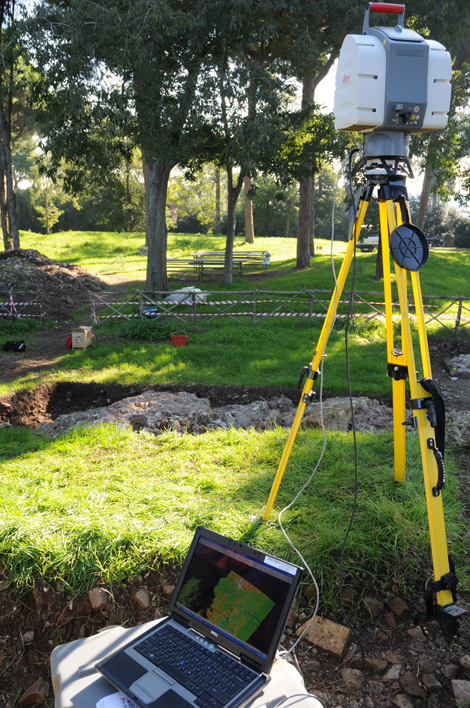 The ability to see a digital analogue of the real physical relationships on site, as they changed through excavation over multiple seasons, has been at the heart of our excavation process. For example, it was only through the combination of various three-dimensional survey and geophysical data that the form and extent of the Portus amphitheatre could be appreciated. The skill of excavators in defining and interpreting spatial relationships is crucial, but this can then be enhanced and revisited by access to three-dimensional representations of their interpretations. Scanstation being used to survey the Building 5.